OK, maybe this isn’t just For Your Reference… it’s for shits and giggles. 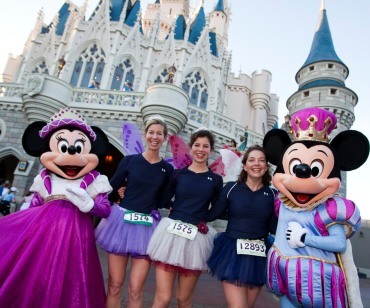 A lot of my girlfriends are runners, so I thought they might want to grab their tiaras and take a trip to Orlando next February…. Sunday, February 27, 2011 at 6:00 a.m. Think you’ve got the commitment, perseverance and determination to be a true princess? Disney’s Princess Half Marathon gives you the chance to prove it. Grab your best friends (or woodland creatures) and register today for a royal quest through 13.1 miles of the Walt Disney World® Resort in Florida. This entry was posted in For Your Reference (recommended articles, sites, etc.) and tagged Disney, disney princesses, half marathon, orlando, running. Bookmark the permalink.